"The only difference between a derelict and a man is a job." I recently did an interview with a film student who was working on a project about how the current economic troubles in the U.S. and around the world were effecting cinema. It was hard to come up with titles for contemporary fictional films that had addressed the situation directly except for Up in the Air [review]. Hollywood has not yet pulled on its big boy pants and gotten relevant to the times. 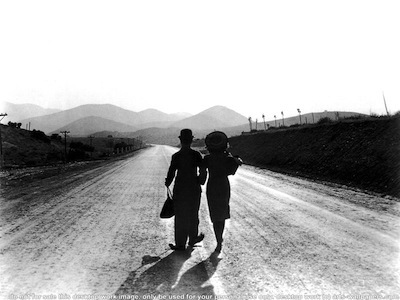 Not like in the Great Depression, when movies by the likes of Frank Capra and Preston Sturges regularly looked at America as it was in the here and now of the moment. 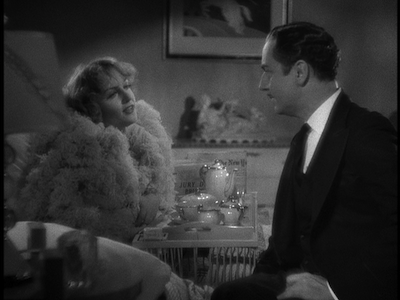 This hadn't come to mind when I chose to re-watch Gregory La Cava's 1936 comedy My Man Godfrey. 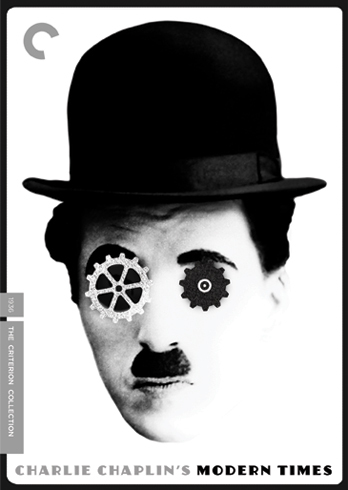 I had picked it for this week's feature because I had seen someone else mention the title and realized I hadn't viewed it in a long time. 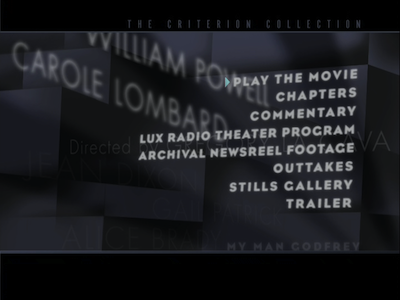 My Man Godfrey would make for a light afternoon matinee. What with me stuck behind a deadline and a little hungover, why not laugh a little? 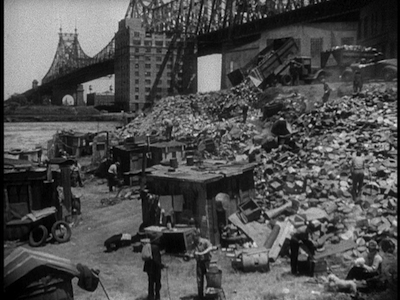 My Man Godfrey opens at the city dump. Two socialite sisters, Cornelia and Irene (Gail Patrick and Carole Lombard), are on a scavenger hunt. One of the items on the list is a "forgotten man," the euphemism for the homeless and displaced. 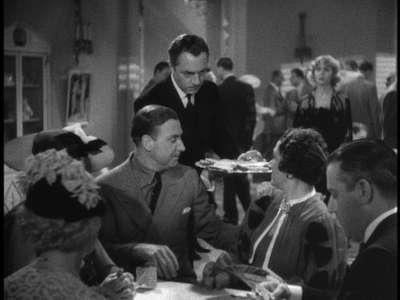 Cornelia goes up to Godfrey (William Powell) and offers him $5 to go back to the party with her and help her win the hunt. Godfrey is rightly offended by this, and he tells Cornelia off. When he quizzes the friendlier, flightier sister, Irene explains the nature of the hunt to him. He agrees to go back with her, if only to beat Cornelia in the game. The hunters are all congregating in a hotel ballroom, and when Godfrey sees the madness and the decadence, he gives the entire party a piece of his mind. There is clearly something different and unexpected about this particular forgotten man: he's remembered to retain his dignity. Feeling bad for dragging Godfrey into this vapid insanity, Irene attempts to make it up to him by offering this displaced fellow a job as the Bullock family butler. ("Do you butle?" she asks him.) He takes it, because a job is a job. Irene even gives him money to buy a new suit. He shows up the next day cleanly shaven and newly dressed, only to find the Bullocks in a state of disrepair following their extensive partying the night before. Mother Bullock, Angelica (Alice Brady), sees pixies in her room, Cornelia is a holy terror, and Irene barely recognizes the man she hired--though once she does, she declares him her protégé and says she will guide him in life. It will be just like the way her mother guides the young Spanish pianist (Mischa Auer) who is always around. Oh, and Irene is also falling in love with her new manservant. It's enough to make a butler run screaming. Apparently, it did the last guy, and many before him. (Actually, the last guy also stole from them, though given later events in the movie, it's possible Cornelia framed him.) 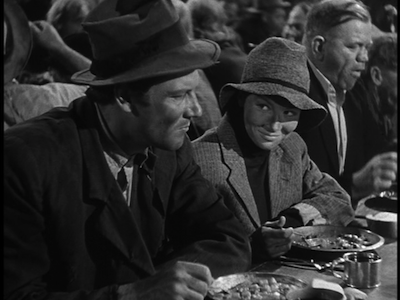 The only one in the Bullock family who seems to have his head on straight is the father (gravel-voiced character actor Eugene Pallette), and he spends most of his time chasing behind his wife and daughters and paying off their bills. He insists they are going to cause him to go broke, but they think he's fooling. He's not. Meanwhile, Godfrey comes into his own as a butler. He masterfully glides through the chaos, finding his purpose through honest work. As he does, his story begins to emerge. He is not so much the down-on-his-luck moneyman that we suspect, he is the son of a wealthy Boston family who dropped out of society when he got a divorce. It was a rash, selfish decision, and his hooking up with the lost souls who ended up sleeping in the garbage heap for a real reason shows him how rash and selfish it was. 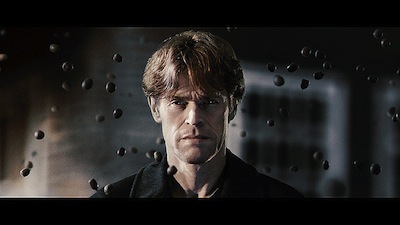 One of his old Boston pals, Tommy Gray (Alan Mowbray), spots him at the Bullocks, and after Tommy agrees to keep his secret, they start to hatch some plans for how to rectify Godfrey's place in life. 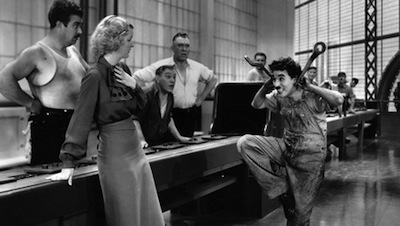 My Man Godfrey was written by Morrie Ryskind, one of the Marx Bros.' writers, and Eric Hatch, one of the scribes on the Topper screenplay, and it was based on a novel by Hatch. It's a compact story, despite spanning a lot of time within its fictional world. In a lot of ways, the narrative progresses off screen. The scenes the writers and La Cava choose to show stand alone as individual comedic situations, and the actual plot is artfully tucked in between as connective tissue. You almost don't notice there is a story at all, the way these characters bat each other around is so funny. 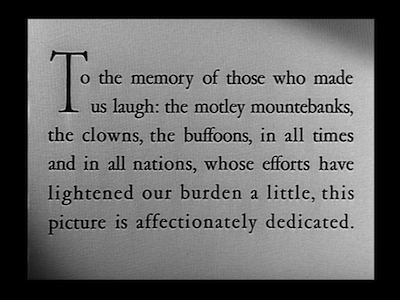 My Man Godfrey is full of witty dialogue and quotable lines. 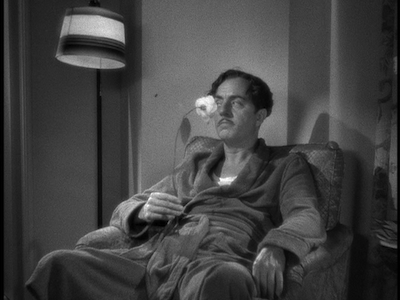 William Powell is marvelous as Godfrey. 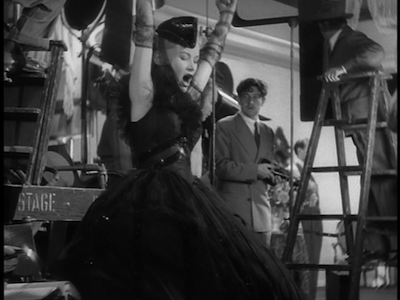 He starts the movie with a hint of menace, but that turns out to be a defense mechanism. Godfrey softens as he regains his confidence. 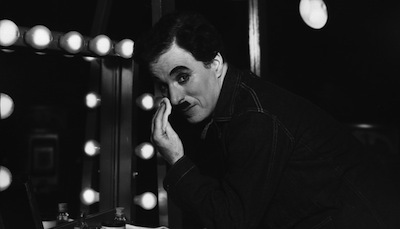 The actor is able to deliver an erudite joke with natural ease, lacing the words with amusement or withering disdain depending on what is called for. 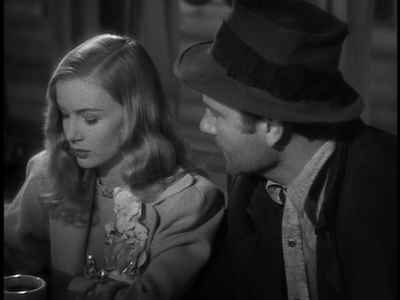 He can also be genuinely nice, something that is particularly evident in his rapport with Carole Lombard. Though they had been a real-life married couple, Powell and Lombard had divorced by the time My Man Godfrey went into production, but if there was any animosity between them, it doesn't follow them onscreen. 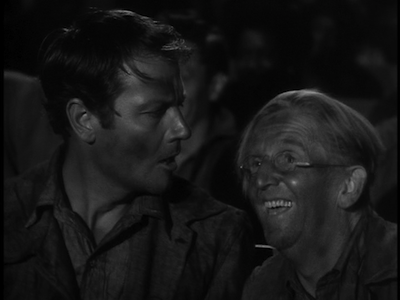 Lombard is a brilliant comedic performer. She manages to make Irene as ridiculous as she needs to be, but you never get the feeling that she is ridiculing the character to do so. 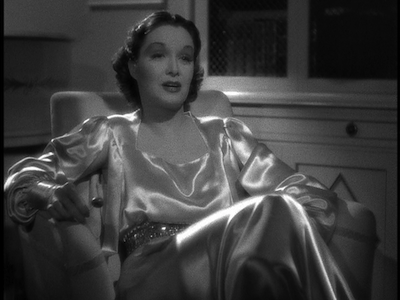 That's because the whole of My Man Godfrey is made with compassion. 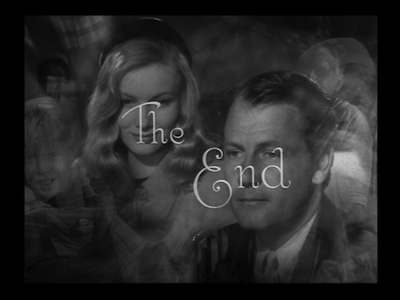 Yes, it's a screwball comedy and a light romance with an ending that drops an out-of-leftfield solution on us. More importantly, though, La Cava has crafted a movie that is sensitive to what is happening all around, and it addresses the situation in a way that manages to keep the levity without forcing a message or condescending to the people whose lives it's meant to uplift. 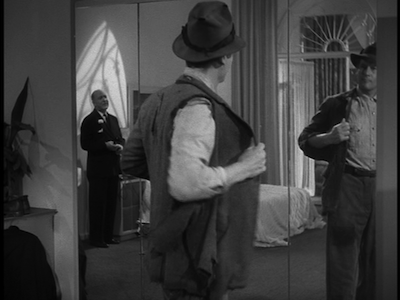 Five years before Sullivan's Travels [review] and Preston Sturges torpedoed the pomposity of socially conscious motion pictures and vindicated the effectiveness of popular entertainment, La Cava made the perfect example of how to do both. 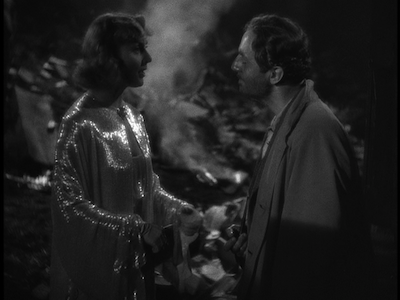 My Man Godfrey is poignant and touching, but it's also very funny and as breezy as they come. The film reminds us to put ourselves in the shoes of our fellow man, regardless of whether they live in a penthouse or in a cardboard box. Everyone has their problems, and it's just a small shift that can put us on one side or the other of the social dividing line. Going from upstairs to downstairs is just a quick tumble. This is also why Up in the Air worked. Jason Reitman's movie isn't so much about the social condition or economic pitfalls as it is about the people it depicts. Characters living a believable life in a world that is recognizable as our own is far more effective than a contrived object lesson. The message is that there is no message, you just have to live and be human. 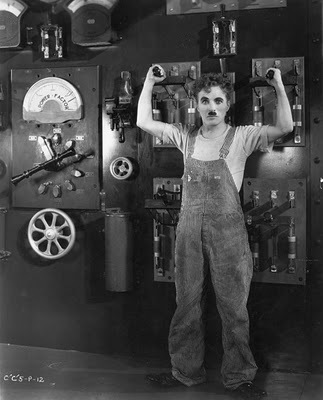 One shudders to think what might happen were someone to decide to remake My Man Godfrey today (please, don't ever let Adam Sandler read my blog), but it really is a movie that speaks to our times. It may have felt very specific when all of these fine folks got together to make it, but what they came up with is timeless and thus eternally relevant. Below are other movies I reviewed over the last month. 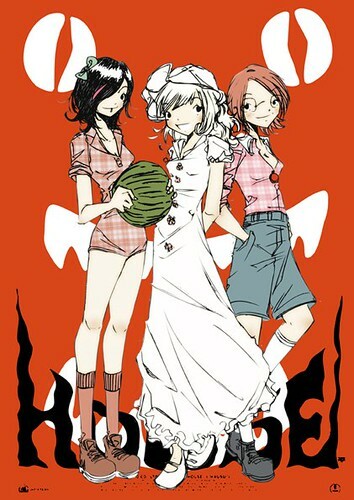 But first, some belated Hausu-themed artwork by Nicolas Hitori De, featuring characters from our comic book Spell Checkers . I figured you all might get a kick out of it. * The Girl Who Kicked the Hornet's Nest, the Swedish crime trilogy yawns and stretches to completion. * Hereafter, Clint Eastwood's meditation on the afterlife fails on nearly every level. A serious contender for worst movie of the year--or at least the most boring. * Never Let Me Go, an undercooked contender. I was really underwhelmed by this. Needed more of the story explained and more character material. 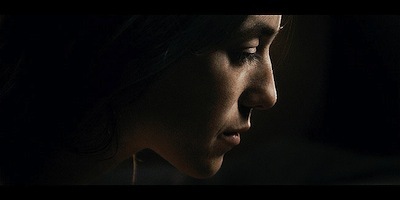 * Agora, a thought-provoking historical epic about the Christian takeover of Alexandria in 4 AD. Starring Rachel Weisz. * Eccentricitie's of a Blonde-Haired Girl, Manoel de Oliveira's not-so-eccentric literary adaptation. 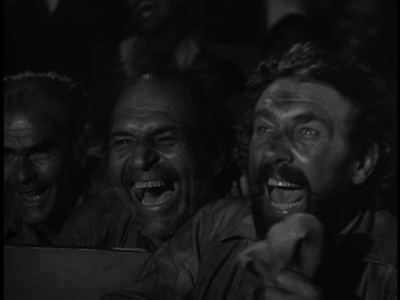 * The Grapes of Wrath, John Ford's astonishing adaptation of John Steinbeck, with Henry Fonda in the lead. Repackaged, not reissued. * I Am Love, melodrama as a sumptuous feast. Starring Tilda Swinton. * Kisses, an excellent Irish drama about two kids on the run from the abusive lives. A fairy tale, both light and dark. * The Pacific, the television miniseries about the campaign against Japan in WWII. The follow-up to Band of Brothers. * Richard III, Ian McKellan's inspired take on the Shakespeare classic, reset in fascist pre-War Britain. * Samurai Vendetta, a tepid swordplay story that is strangely light on the revenge. * Theater of War, an uneven documentary about the 2006 staging of Bertolt Brecht's Mother Courage starring Meryl Streep. It's best when it's just about Brecht himself. * William Shakespeare's Romeo + Juliet, Baz Luhrmann's innovative modern adaptation of the classic doomed romance.